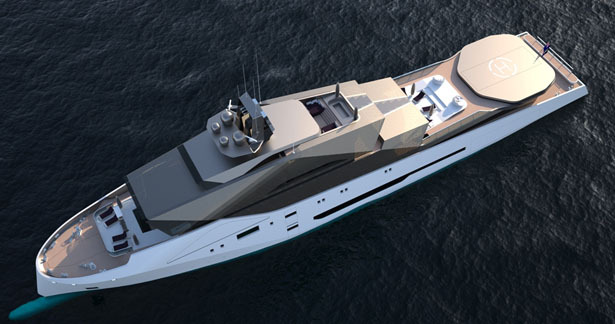 The Dune 90 Explorer superyacht is a “full reset” as far as superyacht design goes. As new generations of yacht designers are entering the market, often with a fresh and unbiased approach to yacht design, the focus for obtaining the most conspicuous superyacht seems to be shifiting from sheer size to innovative design. 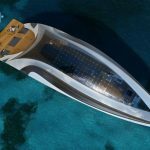 Arman Fissette, a former BMW designer and marine envisioneer, has come up with the Dune 90 Explorer , a truly remarkable project with a monolithic approach to superyacht design. 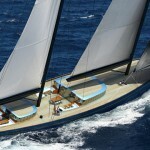 The overall crispness and leanness of its surfaces is something that is very rare for a yacht of this size. While the average size of superyachts leaving the yards these days was something unseen only a few years ago, the typical “wedding cake” stacking style of these floating palaces is something we’ve unfortunately been seeing for many decades now. 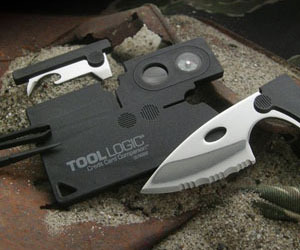 Only a handful of designs really have been able to break out of that straightjacket. Over the years, the market seems to have been conditioned by some sort of “same but bigger” mantra, as this seemed to warrant the most conspicuous yacht in the bay. 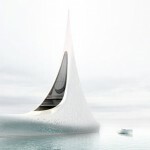 However, with a new generation of yacht designers entering the scene, this reality is changing. Sheer size isn’t a guarantee for attention anymore, design is. 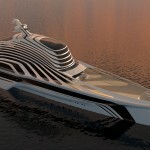 And that’s what a one-of project like a superyacht deserves: a one-of-a-kind and appropriated design. 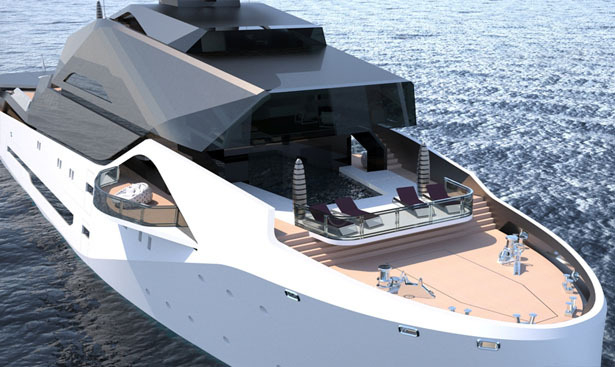 To celebrate the creation of his own design studio “ARMAN”, former BMW designer and marine envisioneer Arman Fissette created an innovative and visionary design style with a more monolithic approach to superyacht design. 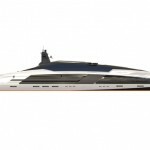 The result is Dune 90 Explorer Superyacht, a truly charismatic yacht, taking inspiration from stealth frigates and swerving dunes, boasting a crispness and leanness that is rare for a yacht of this size. With 90 meter bow to stern, The Dune 90 Explorer Superyacht is a true explorer yacht, equipped for any type of trip, be it on water, land or in the air, in both high-latitude or low-latitude cruising grounds. There’s a helicopter hangar aboard, together with berths for a submarine, an amphibious aircraft, three large tenders, six waverunners and a garage containing four off-road vehicles. While 10 Guest cabins and an owner’s cabin provide enough space to sleep 22, there’s an additional 28 crew aboard to run the yacht and cater to the needs of those aboard. The upper decks are covered by a large glass atrium with arabesque-type light filters to retain a sense of privacy while natural light is allowed in and heat is kept out. 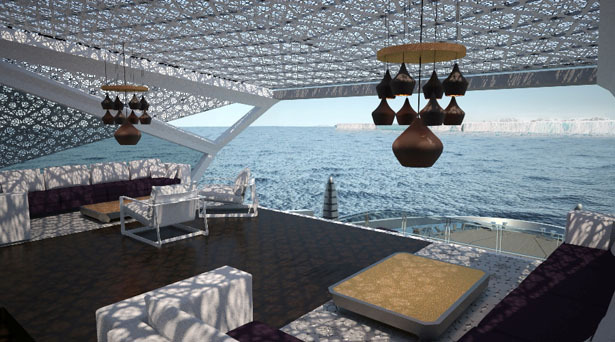 The swimming pool on the foredeck is partially overhung by the owner’s salon which features a large glass facade, called the” visor”. This feature clearly marks the vessel’s inclination towards exploration, as if it were looking out for new things on the horizon. The team behind Dune 90 Explorer Superyacht is currently designing a 75 m. superyacht and going through a yard selection process for both projects. 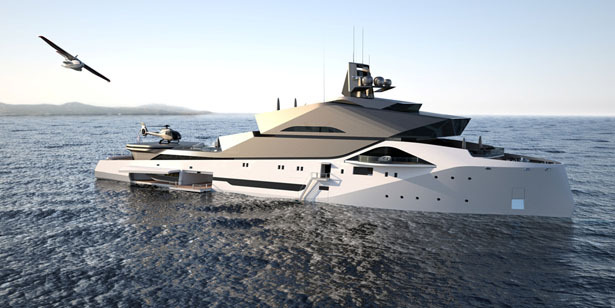 Tuvie has received “Dune 90 Explorer Superyacht” project from our ‘Submit A Design‘ feature, where we welcome our readers to submit their design/concept for publication. 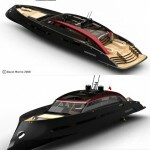 This entry was posted in Yacht and Boat. Tagged as bmw, Designer, explorer, monolithic approach, new generations, remarkable project, size, Yacht, yacht design, yacht designers.